Althoughsubmanifoldscomplexmanifoldshasbeenanactive?eldofstudyfor many years, in some sense this area is not su?ciently covered in the current literature. 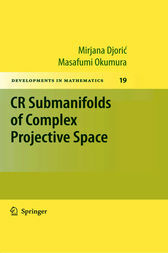 This text deals with the CR submanifolds of complex manifolds, with particular emphasis on CR submanifolds of complex projective space, and it covers the topics which are necessary for learning the basic properties of these manifolds. We are aware that it is impossible to give a complete overview of these submanifolds, but we hope that these notes can serve as an introduction to their study. We present the fundamental de?nitions and results necessary for reaching the frontiers of research in this ?eld. There are many monographs dealing with some current interesting topics in di?erential geometry, but most of these are written as encyclopedias, or research monographs, gathering recent results and giving the readers ample usefulinformationaboutthetopics. Therefore, thesekindsofmonographsare attractive to specialists in di?erential geometry and related ?elds and acce- able to professional di?erential geometers. However, for graduate students who are less advanced in di?erential geometry, these texts might be hard to read without assistance from their instructors. By contrast, the general philosophy of this book is to begin with the elementary facts about complex manifolds and their submanifolds, give some details and proofs, and introduce the reader to the study of CR submanifolds of complex manifolds; especially complex projective space. It includes only a few original results with precise proofs, while the others are cited in the reference list. Mirjana Djoric and Masafumi Okumura are widely published in the field of differential geometry. They have each contributed chapters Springer publictations and have co-published 5 papers on the topic of CR submanifolds in Springer Journals.